Compensation may be earned from links or ads displayed on this website at no cost to you. See Disclosure page for more information. Five reasons why your business needs video marketing. Do not make the mistake of ignoring video marketing. As a business (or a blog), you should be looking towards integrating and utilizing as many marketing tools as possible – especially those that produce the best results. When it comes to video marketing, no other technique comes close to the efficiency it provides. Most marketing professionals state that video is better at conversions than any other medium. So why is video marketing so awesome? The seemingly big stumbling block that prevents video-shy businesses from using this form of medium is that it is a combination of expensive and difficult. Not long ago you needed to splash the cash to produce high-quality videos with professional-standard cameras and complex software that only the most tech-savvy could get their heads around. Now you have HD cameras residing in your pocket on your phone. With video software becoming more sophisticated and user-friendly, marketing with video has taken a drastic shift into the realm of affordability and accessibility. Consider what type of video your audience wants. Equipment counts. You will need a camera, microphone, lighting equipment to provide a quality production. Preparation is key. Draft a script to get your point across clearly and avoid mumbling throughout your video. Try not to just read from it though. Be natural. Get accustomed with a top rated video software program. Create compelling content. The aim with any content marketing option is to generate absorbing content – and video is no exception. Try to be original and credible, experiment when possible and always keep your audience in mind. We are currently in the midst of the visual content craze, a craze that is spearheaded by video content. Although the bulk of your content marketing will generally be comprised of text-based content, the visual variety is so much more effective. 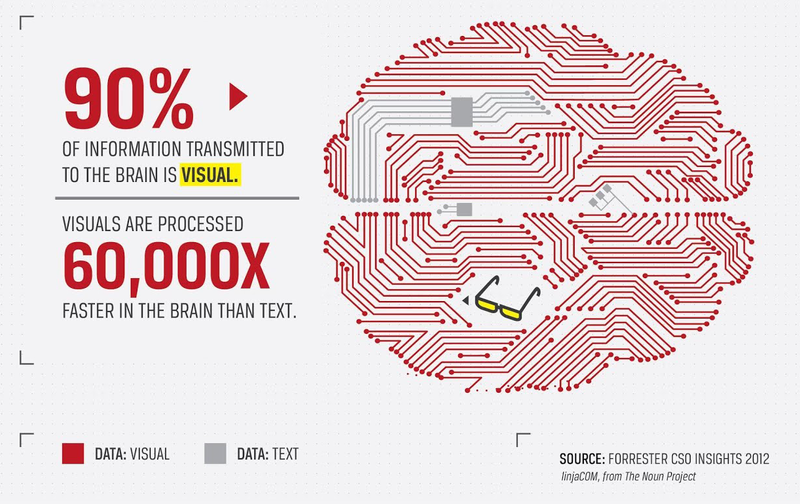 Statistics reveal that we process visuals 60,000x faster than text. There’s a tendency to skim over the written word. The result of this means engagement levels are low, your message will not be conveyed fully and conversions are less likely. Unless, you find something that grabs your attention, such as a bolded piece of text or visual content like images and, you guessed it, videos. When using video, you are immediately tapping into both the visual and auditory systems of the viewer, and creating that vital emotional bond. They are seeing the face and person (quite literally) behind your brand, and picking up on visuals – imagery, body language, expressions – as well as sounds – music, voice – that helps connect and persuade the viewer to make a choice/action. In terms of building trust, seeing or hearing another person helps us to connect on a human level. You can add a great level of personality with video, where humor, testimonials and stories can be included naturally. Viewers share the same emotions and develop a deeper relationship with you and your business – an essential component in gaining a customer’s trust. If you are currently partaking in content marketing, then you will know just how important search engine optimization (SEO) is for your business. Search engines are ranking content that is engaging and valuable to the consumer. While it is perfectly acceptable to host videos on your website, the best way to increase your search impact is by uploading onto YouTube. However, the popularity of YouTube also makes it an incredibly competitive sector when it comes to getting a video ranked prominently. Get views. Post on your website, social media, other blogs, forums, email to subscribers etc. Love it or hate it, this is the era of the social media movement. Therefore; it is valuable to add to your arsenal of marketing tools. Consider incorporating it into your marketing plan. A large majority of businesses are using some form of social media as part of their content marketing strategies, and for good reason: social networking is used 37 minutes per day by the average American which makes it the top online activity in the US. Sharing on social media also gives you the best chance of spreading your message to a large number of targeted customers. One big tip to keep in mind when it comes to sharing on social media is not restrict yourself to only the standard platforms. You want to expand your visibility and reach out to as many potential customers as you can. Naturally, the more social media channels you are on, the better those chances are of developing your brand’s social presence. Click-through rates are increased by 200-300% when you use videos with email. When you consider that email marketing is one of the best tactics for any business to use when it comes to marketing, any advantage gained with this strategy is one worth exploring. And with videos in email being a certified conversion clincher, they should be included as an integral part of your email marketing strategy. Embedding videos within an email message is not necessarily the best way to go about maximizing conversions. The aim is for one click to the landing page, whereas an embedded video would comprise of two clicks – the first click being to watch the video, and the second to reach the landing page destination (which is the priority). Even though it is just one additional click, it can be seriously detrimental to conversion rates. Choose an eye-catching, illustrative screengrab from your video to use as the static image. Make sure the email is in line with the video subject and so viewers aren’t misled. Also have a small explanation about the value of your video in the email, giving customers that added incentive to watch. Play around and have some fun with videos. It’s a great marketing strategy you shouldn’t ignore. Hi, I’m Sheila & I’m so glad you’re here! I'm a newbie blogger looking to make my mark in the world. The goal of this blog is to help you heal your body, your mind, your spirit and your pocketbook. These 4 areas are the focus I intend but I also include some fun information, recipes, parenting tips and whatever else might interest you. Thank you for joining us on this self-discovery journey. How Far Would You Go to Relieve Chronic Pain? Online Business or Store With A Door? What you need to Know About Raw Feeding Your Cats! Do You Love Your Cat But Hate Your Litter Box?